Silicon Controlled Rectifier ( SCR) is a semiconductor device used in switching applications. 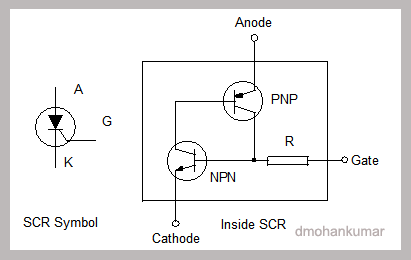 Unlike Transistors, SCR latches once triggered and remain on even if the triggering voltage at the gate is removed. The device can be switched off by removing the Anode current through a Push- to- off switch or by disconnecting the power supply. Silicon Controlled Rectifier (SCR) is a kind of semi conductor device used in switching applications. 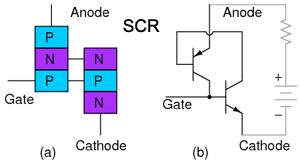 When a positive voltage is applied to its gate, SCR conducts and latches. It remains conductive even if its gate current is removed. The latched SCR can be switched off by removing its Anode current. Don’t miss your favorite TV programme or don’t forget to irrigate garden. This clock controlled circuit will actuate a relay to switch on the AC load to perform the function at the right time. Operation of the circuit is simple. It receives the triggering pulse from the buzzer terminals of the clock and an SCR triggers to activate the relay. The only drawback of the circuit is that, it is necessary to switch off the load manually by turning off the power. You can do experimentation to make an automatic operation also. Modern power control systems utilize electronic devices like Thyristors for power switching, phase control, as chopper etc. These devices also find applications in inverter design, brilliance control in lamps, speed control of motors, Fan speed regulation etc. 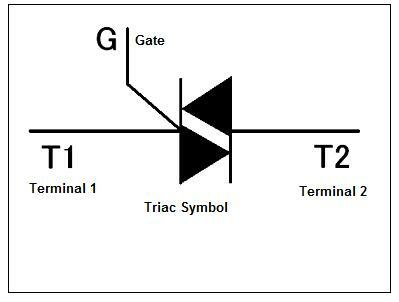 SCR, Triac and Diac are the members of the Thyristor family. 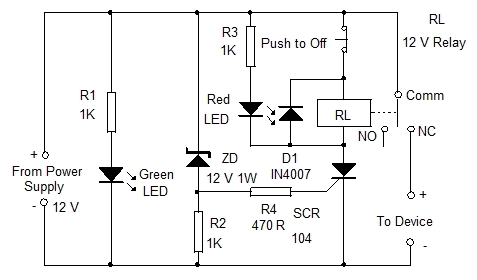 This circuit can sense the overload condition and breaks the power if the load increases above the set point. It is an ideal circuit to protect Uninterrupted Power Supply devices like Inverter.